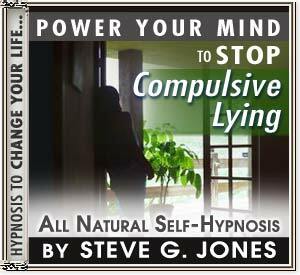 Power Your Mind to Stop Compulsive Lying with Hypnosis! Hypnosis is effective in changing many behaviors. Compulsive lying is a problem for millions of people and one that can cause them to weave tangled webs that destroy trust and relationships. Through hypnosis the compulsion to lie is replaced with the ability to tell the truth. Compulsive lying is not done merely to deceive. Often people will tell lies to save themselves from embarrassment or prevent hurting another's feelings. They will even lie for financial gain or as part of their "sales pitch." With compulsive lying the lies are told for different reasons or no reason at all. The reason or lack thereof is the core problem that hypnosis seeks to correct. Compulsive or chronic lying is actually believed to be a symptom rather than a mental disorder of its own. It could be symptomatic of narcissism or delusional thinking, in which case the lies that are told by the liar are reality to them so they are unaware that they are lying. Hypnosis can make reality a more conscious part of the compulsive liar's thinking. It does this through a therapeutic script that allows for better organization of data that is real and that which is merely perceived by the liar. Dr. Steve G. Jones M.Ed. is a clinical hypnotherapist who has helped compulsive liars gain a firmer grasp on reality. His self hypnosis program, "Stop Compulsive Lying" can effectively change the outward responses of the person with the disorders related to chronic lying.